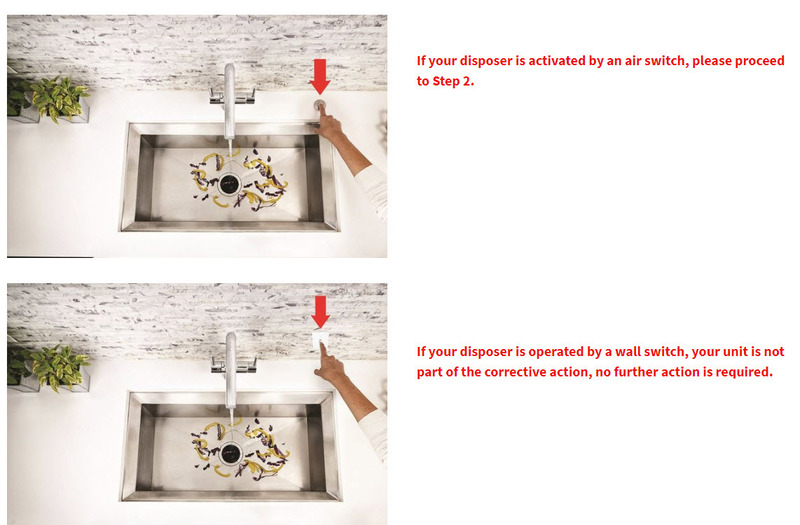 InSinkErator is undertaking a voluntary corrective action plan that affects some installations of certain models of disposers, please see below list of affected models. InSinkErator has determined that improper installation of the disposer or damage to the air switch can result in a potential fire hazard. If your disposer is activated by an air switch, your unit may need corrective action. If your disposer is operated by a wall switch, your unit is not part of the corrective action and no work needs to be done. See pictures for examples. Look at your disposer and search for a tube coming from an air switch into the side of the unit. See the picture below for an example. If you cannot find a tube connecting from an air switch to the disposer or if the tube enters the bottom of the unit instead of the side, your unit is not part of the corrective action and no work needs to be done. If your disposer has a tube between the air switch and the side (not the bottom) of the unit, verify if there is a yellow tag at the end of the cord. If a yellow tag is present, your unit is not part of the corrective action and no work needs to be done. If your disposer has a tube between the air switch and the side of the unit and does not have a yellow tag at the end of the cord, your unit is part of the corrective action. If you believe your unit is affected by this corrective action, please contact the InSinkErator office in your country to request a corrective action repair kit. United Kingdom residents, contact us here. Australia residents, call 1300 136 205 or email at sales@insinkerator.com.au.